Ontology is the study or concern about what kinds of things exists and ontology is about to extract description of things and their relationships. URL Filtering provides optimized web security through full integration in the gateway to prevent bypass through external proxies. Our URL filtering service helps protect businesses from the ramifications of inappropriate Web use and assists in blocking access to websites by URL. It provides flexibility in dealing following operations:. Monitors performance and availability of websites using HTTP and HTTPS requests, from end-user perspective. Monitors just a single URL or a sequence of URLs. Record sa sequence of HTTP requests and configure it to be checked at regular intervals of time. This will hence help you ensure your website / web application is functioning properly. 1. Crawl the URL and extract html text from URL. We are extracting contents from iframe sites that have enhanced the accuracy of our categorizer. 2. 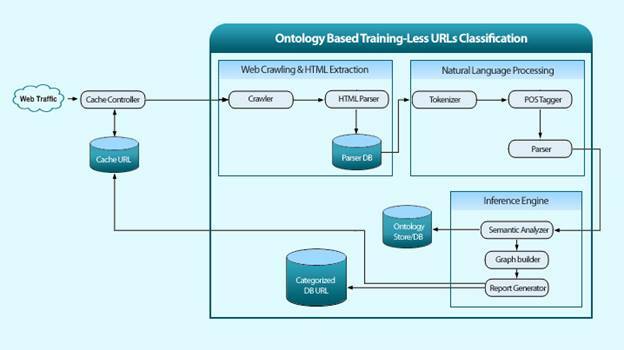 Performs Natural Language processing on that URL by applying the following operations. a) Tokenize sthe html text. b) Does POS tagging on tokenize file. c) Parses the pos tagging file to the next module. 3. Parse file in inference engine where we perform following operations. a) Perform semantic analysis on parse data. b) Build a graph of data. c) Generate the report and make a decision about URL category. 4. We have leveraged our system to a multi-threaded approached from the single-threaded architecture, which has greatly enhanced our performance. Sets of URLç—´ are running simultaneously and in modularized way that result in great enhancement in terms of overall system efficiency.